Do You Need a PSA Test To Screen For Prostate Cancer? At its annual meeting in May 2013, the American Urological Association (AUA) announced updated recommendations about when and for which men prostate specific antigen (PSA) testing was appropriate. The blood test measures levels of prostate specific antigen, a protein produced by cells in the prostate gland. Higher levels of PSA can indicate the presence of a tumor, but a rise in PSA can also be caused by an infection or benign prostate enlargement. A biopsy is needed for a definitive diagnosis. To better understand what’s behind the new recommendations and the benefits and risks associated with PSA screening, we talked with prostate cancer specialist Edward Schaeffer, M.D., PhD. Q: What are the AUA’s new recommendations? Dr. Edward Schaeffer (ES): The AUA announced five new guidelines that they encourage urologists to follow for prostate cancer early detection. Do not screen men under the age of 40 who do not have symptoms of prostate cancer. The reason PSA testing is not recommended for this group is that there is a low level of clinically detectable prostate cancer in these men. In addition, studies found no evidence that PSA testing offered any benefits to this group and that testing did, in fact, expose the men to potential harm, including incontinence and impotence, from unnecessary testing and treatment caused by false positive test results. Do not routinely screen men between age 40 and 54 who are at average risk for prostate cancer. The recommendation does state that for patients who are at a higher than average risk, including African Americans or men with a family history of prostate cancer, the decision of whether or not to undergo a PSA test should be made on an individual basis by the patient and physician. For men between 55 and 69, the AUA recommends that men and their physicians make a shared decision about whether the potential benefits of preventing death from prostate cancer outweighs the potential harm of unneeded testing and treatment. The guidelines also state that testing appears to offer the greatest benefit to men in this age group. Men between 55 and 69 who choose to undergo PSA testing should be tested every two years rather than annually. Compared to annual screening, studies suggest that screening every two years offers the benefits of early detection while decreasing over diagnosis of prostate cancer and false positive results. 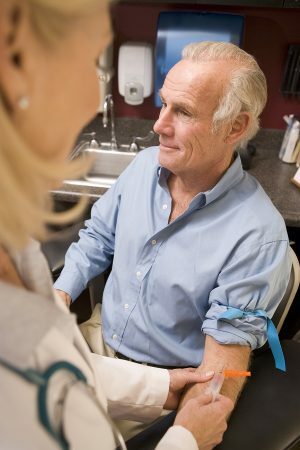 PSA testing is not recommended for men over the age of 70 or men whose life expectancy is less than 10 to 15 years. This is a new recommendation. The panel did note, however, that men in this age range who are in excellent health may benefit from PSA testing. That’s a shared decision that should be made by the patient and his physician. Q: How did the AUA develop these guidelines? ES: The guidelines were developed by having an independent group systematically review and perform a meta-analysis on the published literature on prostate cancer screening and detection. The group reviewed articles published on randomized controlled trials undertaken between 1995 and 2013 and evaluated the quality of the evidence presented. The new guidelines assessed each of the studies in the meta-analysis and weighted them based on the quality of the study. Thus, the data derived from each study included in the analysis were not treated equally. What this means is that the new guidelines are based on data that has been carefully evaluated, which is a good thing and a strength of the AUA guidelines. In contrast, last year’s recommendations on PSA testing from the U.S. Preventive Services Task Force (USPSTF) was based on only two studies that were weighted equally in the development of the recommendations. Many would argue, however, that the studies were not equal based on several important factors including sample size, screening intervals and contamination. In addition, the AUA guidelines were developed by experts in prostate cancer—urologists, medical and radiation oncologists and epidemiologists, while the USPSTF recommendations were developed primary care physicians, who did not have expertise in the diagnosis and treatment of prostate cancer, and epidemiologists. Q: What should men who are concerned about prostate cancer do? ES: They should be proactive and talk with their physician and medical advisors about the test. They should share their complete family history and discuss risk factors such as age, race and whether they have a family member who was diagnosed with prostate cancer. Have a conversation about the risks and benefits of PSA testing in your particular situation so that you can come to an informed decision.